I've hesitated writing about CPK for a long time now because I am positive that it will ruin my credibility as any sort of blogger who knows things about food, but I cannot hide my love for California Pizza Kitchen any longer! I know its a chain and that it is slightly overpriced, but they have a few menu items that have just won my heart and will keep me coming back for more. Even thought it's located at the mall, California Pizza Kitchen is really good about getting you in as fast as they can. If you don't want to wait at all to eat, they are usually quite open if you get there before 6, and if there is a wait, then they will give you a pager and let you go shopping all over the mall until your table is ready! Much better than sitting on that patch of grass outside Olive Garden, which I've seen way too often... Every time we've been there, we've had fairly good service, even when they are super busy, and the wait is just about what I would expect. Even though it will surely lead to a heart attack one day, we always have to start with these avocado club egg rolls. They are SO GOOD! 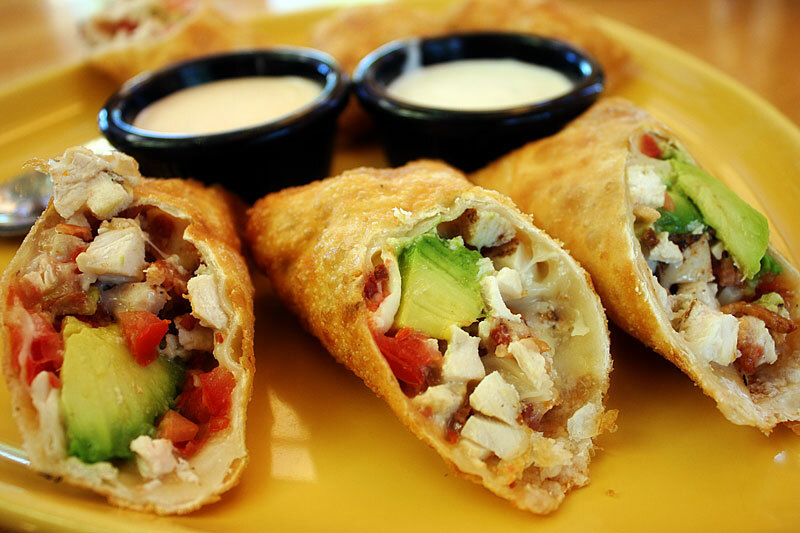 Stuffed with tomato, chicken, cheese, bacon, and large slices of avocado and deep fried in a wonton wrapper -- these babies are the stuff of my dreams people. They are served with this "ranchito" sauce...I have no idea what that means, but it's heaven when drizzled over these egg rolls. My arteries are probably getting clogged just by looking at this picture, but I seriously can't help myself with these. One of my favorite parts of CPK pizzas is their crust. It's pretty thin, but still chewy and flavorful and almost has this unique tangy taste - I don't know what it is, but I love it! Sadly, this thin crispy crust pizza was, well, crispy, and wasn't as amazing as the normal pizzas to me. I liked the flavor of this pizza however. 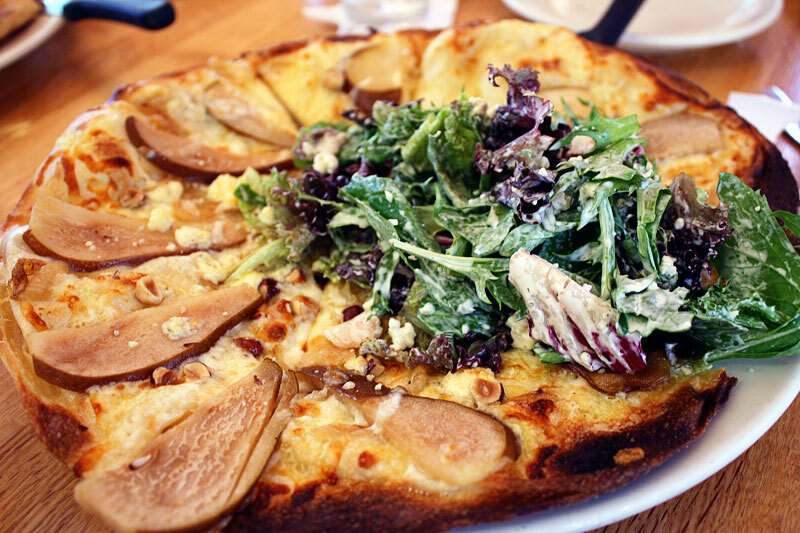 The gorgonzola cheese wasn't too overpowering, and the pears paired nicely with the arugula on top. I was worried that it would be too difficult to eat and that leftovers would be no good because the arugula would get soggy, but neither of these two things turned out to be a problem. The pear was a little drier than I would have personally liked, but overall, it was a fun deviation from the normal pizza options. We love spicy food, and Owen almost always orders the Spicy Chipotle Chicken pizza, but this time I convinced him to try something new and we were not disappointed! The carnitas were succulent and in good supply on this pizza, and even though our waitress warned us about the spiciness of the habeñero salsa that was served on the side, we found it to be just right. The cilantro pesto base added some nice flavor to the pizza, and we thought it was delicious! 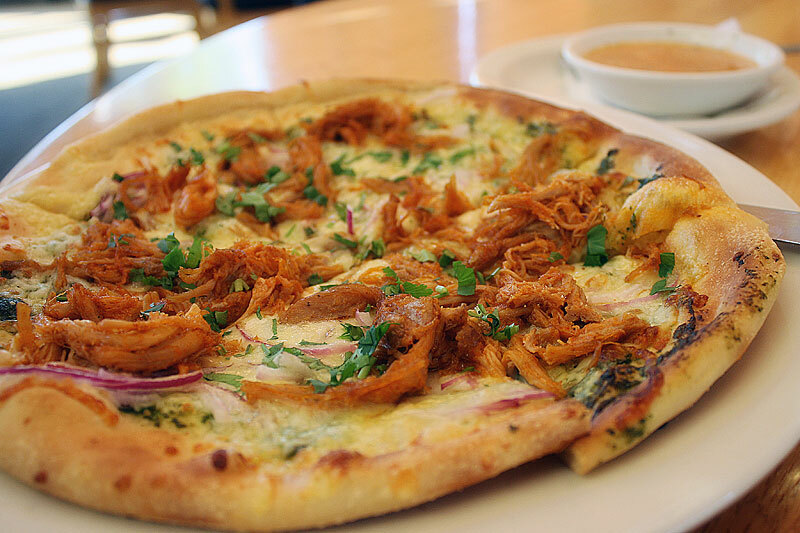 What You Should Do: Even though it's a chain and many people may turn their noses up, I definitely think California Pizza Kitchen is worthy of your time and money. We've tried a variety of items here and have been satisfied and happy after every visit. Though I normally prefer the original crust pizzas, if you want to go thin & crispy, I would recommend the Jamaican Jerk Chicken pizza too! I love all of their unique pizza flavors and can never get enough of those darn avocado egg rolls...they've got me hooked. I've never tried any of their pastas or salads, so I can't vouch for them, but the pizzas are great and if you order two, there is almost always enough left over for lunch the next day - awesome! CPK is a pretty decent chain, I agree.